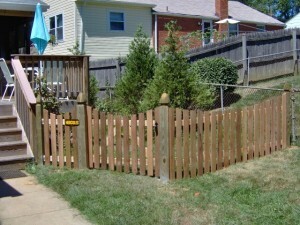 Is a Wood Fence the Right Fence for my Manassas Home? You live in Manassas, Virginia, the No. 1 top small city in the state, according to Citiesjournal.com. The city’s motto: “Salus Populi Suprema Lex.” When translated, Manassas’ motto means “The Welfare of the People is our Supreme Law.” So it is no wonder that the small city was ranked one of Virginia’s safest by SafeWise.com. The site analyzed the number of Violent Crimes and Property Crimes in the area as well as FBI Crime Report data from 2012. SafeWise.com determined that there’s just a 1 in 1,000 chance of violent crime in Manassas and a 15 in 1,000 chance of property crime. We at Hercules Fence like to think we have a little to do with this. After all, as Northern Virginia’s largest fencing company, we have installed our fair share of fences throughout Manassas. And a fence is a great way to deter would-be burglars. But which fence is right for your home? When it comes to choosing the right fence for your home, you can’t go wrong with wood. A wood fence is simply beautiful, offering an aesthetic appeal unmatched by other fences. And while wood may require annual maintenance, it is well worth the extra work. Wood fences offer homeowners more customization than other types of fences. Want to stain your fence? Stain it. Want to paint your fence? Then paint it. When properly maintained, your wood fence will last a very, very long time. Click Here to learn more about the benefits of wood fences. If you have any questions about Wood Fence Installation in Manassas, the largest residential fence company in Northern Virginia, you can contact us today by calling (703) 551-2609 or visiting our website. Also, check out Hercules Fence of Manassas on Facebook, Twitter, Google+ and YouTube! This entry was posted on Wednesday, May 28th, 2014 at 3:54 pm. Both comments and pings are currently closed.